Attention Trader Joe's enthusiasts: The store has announced a recall of a popular salad blend. Calling all Trader Joe's shoppers: It may be time to clean out the refrigerator. 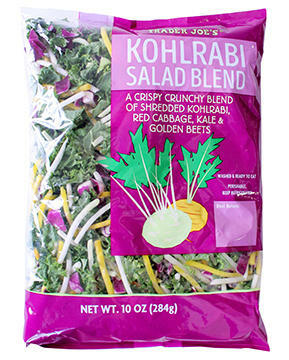 The grocery chain is recalling all bags of Trader Joe’s Kohlrabi Salad Blend (SKU#58614) with the date codes “Best Before: October 14th, October 15th and October 16th” because, according to Traderjoes.com, the product may have the potential to be contaminated with Listeria monocytogenes. The recalled Salad Blends were sold in stores nationwide. Although no illnesses have been reported, and all potentially affected products have been removed from the popular grocery store chain, it's extremely important to discard of the product or return it for a full refund. According to the Centers for Disease Control (CDC), an estimated 1,600 people get listeriosis each year—and the infection is most likely to sicken pregnant women and their newborns, adults aged 65 or older, and people with weakened immune systems.